I have had this gluten free strawberry biscuit ready since last summer. We made a video and then life got busy and the editing got put on the back burner. It’s a funny video with the twins, but it’s instructional and you might want to check it out. 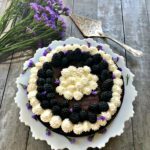 By the way, I hope you know I have a youtube channel with gluten free baked goods, and grain free baked good. 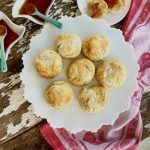 The gluten free biscuits are the most popular, and are similar to these but not sweet. 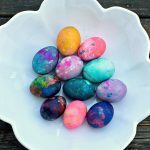 You can make these with sugar or go sugar free with Swerve. There’s a story to the gluten free strawberry biscuit. It’s a natural progression from a recipe we made one long hot summer. Little orphan kittens were found in the wall of the barn and we decided to have a lemonade stand to raise money for their care. We added strawberry biscuits to increase our sales and it worked! The twins couldn’t eat them fast enough. I decided to make a practice batch changing the recipe to adapt this recipe to gluten free strawberry biscuits and within ten minutes, Mr. Spinach Tiger ate three of them. He just kept saying over and over, “I can’t believe these are gluten free.” These taste just like your other recipe. 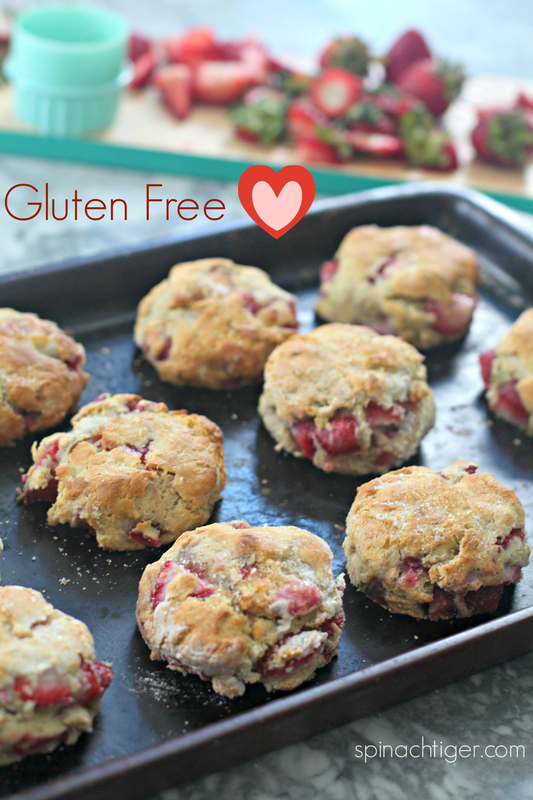 So how did I develop the perfect gluten free strawberry biscuits recipe? I took this recipe for strawberries and cream biscuits and tweaked it. I traded cream for milk with yogurt. I decreased the butter, increased the sugar and used the best strawberries I could find. These are ten kisses. 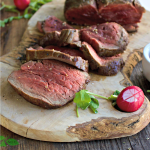 They are wonderful for breakfast, can be frozen and reheated. I want to take this time to remind you that I have a very popular regular gluten free biscuit here. 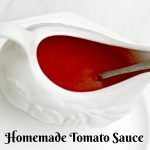 It’s our number 2 post of over 1,000 recipes here, and I have built upon its success, because you have loved it and told me so. 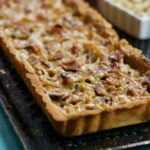 It’s also number one on google and people have left the nicest comments for this recipe. 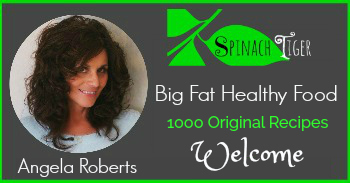 My favorite gluten free flour is Bob’s Red Mill One to One. Make sure the fruit is covered with flour. This helps them stay whole. 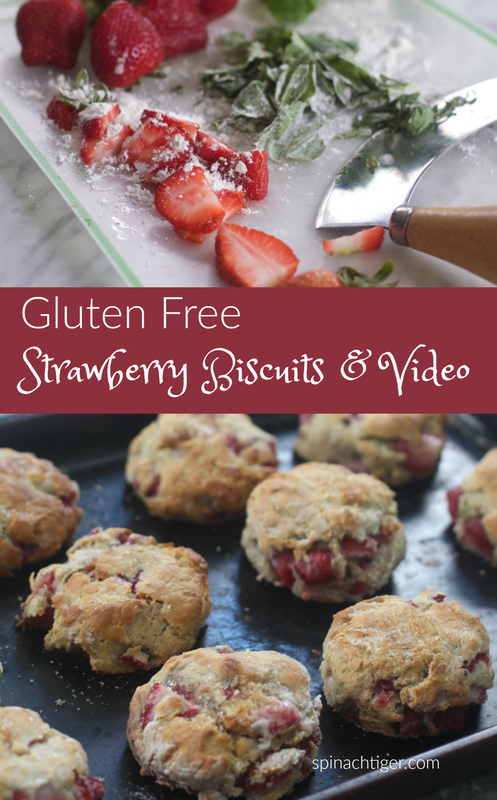 You can freeze gluten free strawberry biscuits. Microwave for about 20 seconds. Don’t eat gluten free biscuits until they cool. They tend to be gummy when piping hot, but the texture changes once they cool. Add chopped fresh herbs to the flour such as basil or lemon thyme. 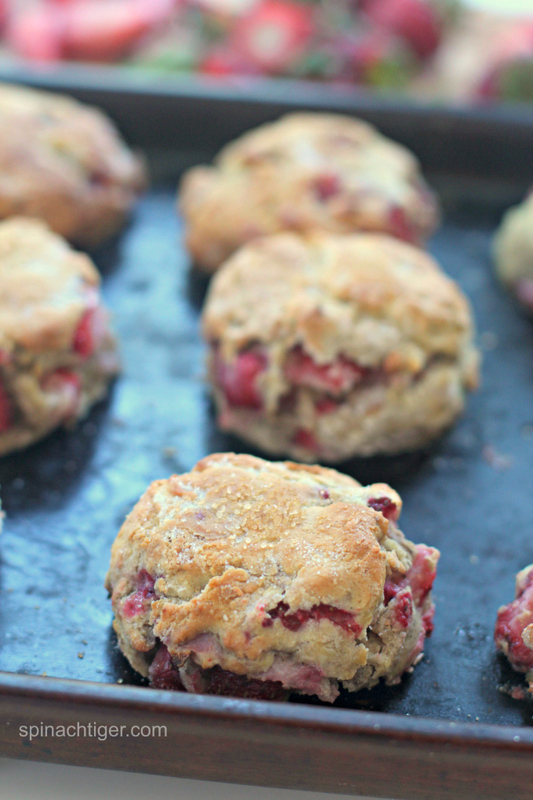 If you like this recipe, you will also love our gluten free strawberry scones. 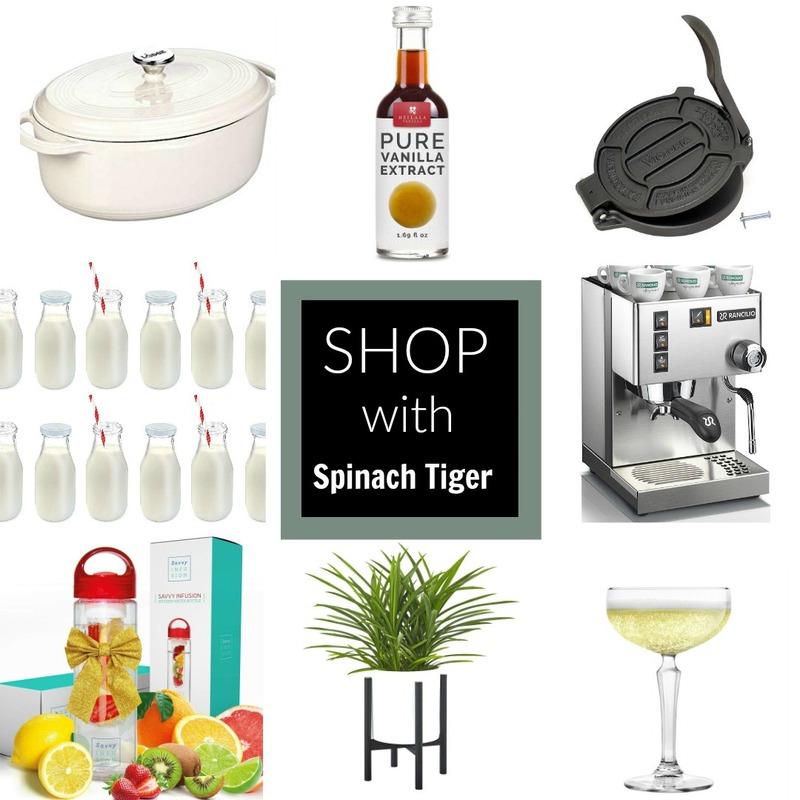 Disclosure: This site contains Amazon affiliate links which earn a small commission aiding in Spinach Tiger’s operations, but does not increase your price. Much appreciated. 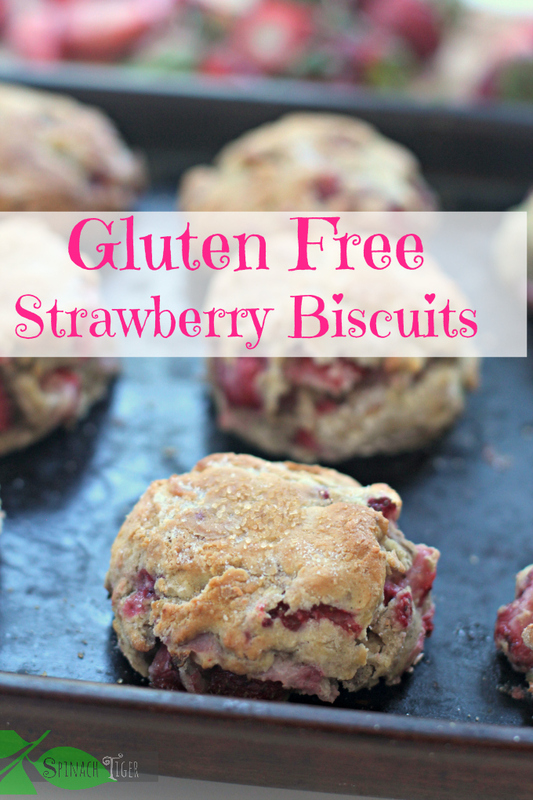 Gluten Free Strawberry Biscuits perfect for breakfast or anytime. 2½ cups gluten free flour, divided 2 cups and ½ cup. Use 2¼ inch biscuit cutter. Cut butter into small pieces. Freeze 15 minutes. Gently toss strawberries with some gluten free flour. Add vanilla yogurt to the milk. If you don't have vanilla yogurt, add a teaspoon vanilla. Whisk in egg. Set aside. Important. Use only 2 cups of flour for mixture. The rest of the flour is used for strawberries and for cutting biscuits. Mix all dry ingredients together. This would be the time to add in freshly chopped herbs. Add strawberries to the mixture before you add in wet ingredients. 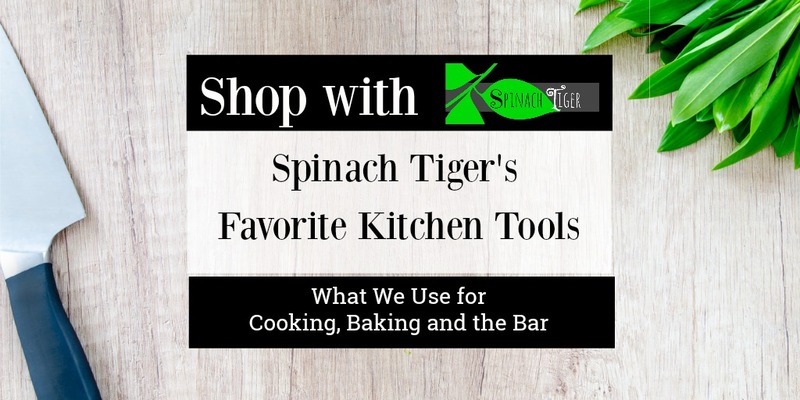 Using a wooden spoon, add in wet ingredients to dry ingredients. Dough will be sticky and that's good. Use hands to form a disk and put flour under the disc and on top of it so you can cut the biscuits. Use biscuit cutter and cut 12 biscuits (bigger or smaller if you prefer). Can use plain yogurt. Just add ½ teaspoon vanilla.